Posted in: Avid, Radio Control, Team Associated, Team Losi Racing. Tagged: New Releases, RC, Upgrades. Avid RC is taking a huge round of applause from Associated and TLR owners. 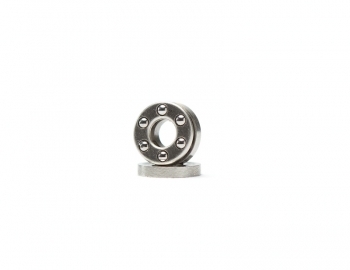 Those small, loose, steel balls that fall everywhere and leave you covered in grease during the rebuilding process of your diff, can now be replaced with the Associated/TLR Diff Thrust Bearing. This product will Fit all B4.2, T4.2, SC10.2, SC10B as well as the TLR 22, 22T and the 22 SCT. This one piece solution to the multi-ball nightmare is available in 3 different types and will make rebuilding your diff a breeze. More details can be found at Avidrc.com or click HERE to be taken directly to the thrust bearings. I have been a casual observer of Avid for a while, I have heard and read great things about their bearings. I have had my eye on the Avid TLR Aluminum Topshaft Kit & Triad Slipper for some time and I think it is time for me to get some hands on experience with some Avid products. I just ordered a few of the Steel Thrust Bearings and the Aluminum Topshaft kit for my TLR 22SCT. As usual I will keep you informed. Need help building your Diff? Check out Building a TLR 22 Diff with Matt Castellano.